Should you buy a curved screen TV? UK retail giant Tesco have just announced the successor to their immensely popular Hudl tablet – the Hudl2. The Hudl2 undercuts the likes of Samsung and Apple with a rather unbeatable price of £129. The original Hudl was incredibly popular with people having to sell their own body parts to get hold of one. The Hudle2 is better than its predecessor in every way and is larger, faster and more premium looking. The design philosophy hasn’t changed however with a similar look and feel. The new Hudle features a 8.3 inch full HD display which is not only bigger that its predecessor, but also features smaller bezels giving for a much premium feel.The device is powered by a 1.83GHZ Intel Atom Quad Core processor with 2GB RAM. The 16 GB internal memory is fully expandable via a Micro SD slot and the device also features a 5MP rear facing camera. According to Tesco the Hudl2 is three times faster than its predecessor so it should be able to handle all the latest games and apps. 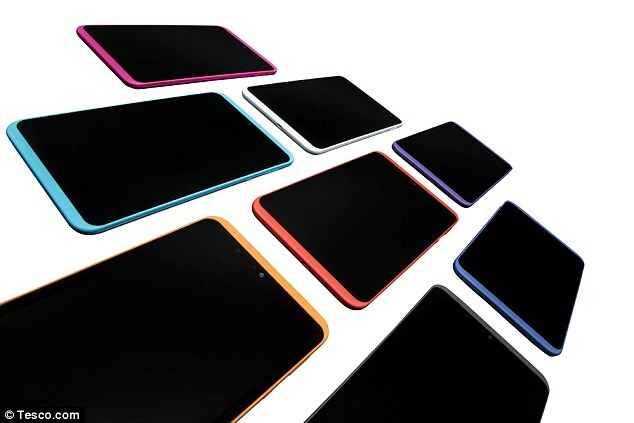 The Hudl2 is available in eight different colours and should be available from October 9th. The original Hudl sold 750,000 units in the first year and Tesco will hope that this latest model with help turn around struggling share prices and put to bed some negative press. It would seem that the marriage between Ebay and its Payment service Paypal is to coming to an end. According to TechCrunch Paypal is to be spun off as a separate company and will no longer come under the Ebay umbrella. The 12 year partnership will end amicably with Paypal becoming a public listed company with both companies getting new skippers. Apparently this is a strategic move initiated by Ebay’s board of directors and is aimed at growing both companies within their respective markets. The move is expected to go ahead later in 2015 and will see Paypal better placed to compete with other mobile payment services such as Apple Pay. Is the Blackberry Passport the ugliest phone ever? I’m not quite sure what Blackberry were thinking with their curious new smartphone, the Passport. The device is a strange looking little thing with a screen aspect not commonly used in todays smartphones. Furthermore, the Passport may just be the ugliest smartphone I have ever laid my eyes on. I’m just clueless as to what Blackberry were thinking. The new device is based around a decent sized 4.5 inch IPS display with a resolution of 1440 x 1440. This equates to a brilliantly sharp 453 pixels per inch (PPI). When you compare this to the 326 PPI of the iPhone 6 you can understand just how sharp this is. The display is really very good and is one of the smartphones best features. Actually, talking about the other specifications, these are also rather good. The device features a speedy Snapdragon 801 Quad Core processor clocked at 2.26GHZ and even has 3GB of RAM. Furthermore, in the optics department we have a 13MP snapper which features optical image stabilisation. What has to let the device down then is the peculiar design. As already mentioned the screen aspect is rather unconventional with a ratio of 1:1, and the device itself is pretty huge. It definitely falls into the phablet category with a width of 3.5 inches. In comparison, this is wider than even the Samsung Galaxy Note 3. From what we understand however the build quality is pretty good with a stainless steel rim running around the edges and a soft touch plastic battery cover on the back. Blackberry have also done away with their traditional 4 row keyboard and have opted for 3 rows. Its still full QWERTY but commentators are stating it feels rather squashed. The Passport comes running Blackberry OS 10.3 with the Amazon App store pre-installed. Here lies a problem as you will not have access to the Google Play Store. Although the Amazon App store is now pretty comprehensive, you will still struggle to find some of your favourite games. So whilst the Blackberry Passport has excellent specs and a great camera, the design is going to make it difficult to use. Can you imagine trying to squeeze this massive square into you pocket? It certainly isn’t going to be comfortable! Certainly not suitable for skinny jeans. The screen aspect is also going to make certain games and Apps feel awkward. That said, for business functionaltiy such as viewing and editing documents, it should be excellent. And it is indeed the business audience which Blackberry are targeting with this device. With specs this good and a market leading display, I do wonder why Blackberry didn’t try to make a more universally appealing device. Although I appreciate that they have struggled to crack the domestic smartphone market and as such are clearly attempting to win back their traditional business customers. So is the Blackberry Passport the ugliest smartphone on the planet? Possibly, although I imagine its rather like marmite – you either love it or you hate it! Do I want one? Absolutely not…… actually I sort of love it. Release of HTC M8 Eye imminent? It may seem like only yesterday that HTC released the stunning M8, but already people are talking about HTC’s next rumoured smartphone – the M8 Eye. The M8 Eye is basically the same as the original M8, but with one significant difference – a 13MP Duo camera. According to GSMArena the M8 Eye is due to be released sometime in late October and will come running Android 4.4.4 KitKat, with HTC’s own Sense 6 software running on top. If you weren’t already aware, here at LivelyState we are big fans of the original M8. The stunning design and beautiful screen are only part of what makes it such an attractive purchase. We, like many others, however were disappointed with the camera performance. This spoilt what was otherwise and superb smartphone. HTC had been adamant that camera performance was not all about the number of pixels, and the UltraPixel camera was the product of this philosophy. Whilst the HTC One M8 is certainly one of the best phones on the market, the improved M8 Eye is sure to become one of the best smartphones money can buy. We certainly cannot wait to get our hands on one. iOS 8.0.2 update with support for HealthKit apps rolls out. Well after a few days of embarrassment for Apple, finally the latest IOS 8 patch has been rolled out. As you may recall, when iOS went live a week ago Apple had to disable support for HealthKit app integration due to various issues. The iOS 8.0.1 patch had supposed to resolve this and enable HealthKit apps, but this was subsequently recalled due to it causing issues with signal and Touch ID, amongst other issues. Well today iOS 8.0.2 is finally being rolled out and we can confirm that this has now enabled support for HealthKit applications. These third part apps are designed to integrate with Apples Health Kit suite and offer simplified interfaces and extra features. According to 9to5Mac, the only one currently available is FitPort which acts as a cool interface for your health stats. To be fair on Apple, it has only taken a few days to resolve the issue and fans will be pleased to get to grips with the new health apps. It seems its not all been plain sailing with the rollout of Apples latest iOS 8 update. After the HealthKit fiasco Apple have now had another embarrassment in the form of the iOS 8.0.1 update which only went live earlier today. The update was slated as bringing some major fixes to the platform, but this has now also been pulled from the app store due to some user reported bugs. Apple will clearly be feeling a little red faced in light of this further hiccup. For more information check our source 9to5Mac. Apple likely to shut down Beats music. News just in via TechCrunch suggests that Apple is seemingly shutting down its its Beats Music streaming service. According to TechCrunch Apple has recently moved many engineers off the Beats product and on to several other Apple projects. Apparently inside sources confirm that Beats Music really does look likely to be scrapped, but what Apple is planning is unknown. Beats was acquired back in May by Apple but what was planned for the streaming service has been a bit of a mystery. One thing we do know is that Apple are paying more attention to the iTunes platform so perhaps this will include some sort of Beats integration. Who knows what will happen to Beats Music but this latest news comes as a bit of a surprise. The first thing that strikes me about the new iPhone 6 is just how cool it is. The build quality is excellent and the design just oozes class. What is particularly striking is how light the device is. At first I found it a little off putting but now I’m totally used to it and it feels great.The all metal frame of the iPhone 6 is immensely thin and I love what Apple have done with the power button. If you didn’t already know then this has been moved to the side. It makes it much easier to access, when you consider the new girth! Build quality aside, the device is lightning fast. Apple tell us it is 25% faster than the 5S but only time will tell wether this is strictly true. What I can say is that I have experienced no lag whatsoever and iOS 8 feels buttery smooth. I love how a light double tap of the home button reduces the screen size for single handed use. It just works and its simple to initiate. The new speaker sounds much better than on the 5S and kicks out some really cool sounding beats. It also placed in such a way that landscape gaming does not result in your hand sitting over the speaker. If your worried about the 6’s size then don’t. Its super thin and fits easily in the pocket. One slight pain is that the new camera lens protrudes from the chassis. This is a bit annoying but as soon as you get a case on it its irrelevant. The camera is amazing by the way and the new slow motion mode is really cool to play with. I don’t want to go into too much detail but the camera focuses really quick and picture quality is ace. My fist impressions are really positive and there is no doubt the iPhone 6 is set to become one of the best handsets of all time. Stay tuned for a full review. Please comment below and let me know how you are enjoying your you iPhone 6. Back in 2001 Nintendo unleashed on the world the incredible Gameboy Advance – or GBA for short. 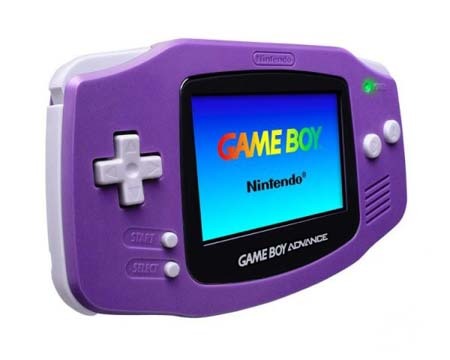 The GBA was the successor to the enormously successful Gameboy Colour and went on to consolidate Nintendo’s position as being the top dog in the gaming market. The console featured a 32-Bit processor and a 2.9 inch full colour TFT display with a 240×160 resolution. One flaw in the design was Nintendo’s decision not to include a back light for the display. This meant no playing in the dark which was a bit of a downer. This wasn’t the end of the world however with a simple clip on light rectifying the issue. The GBA was one of Nintendo’s best selling handhelds ever. It was a little unnecessary, in that the Gameboy Colour was still selling like hotcakes, but Nintendo were determined to stay ahead of the curve. There was little competition for the GBA other than the Nokia N’Gage and the Neo Geo Pocket Colour. Whilst the N-Gage failed to really convince anyone it was a force to be reckoned with, the Pocket Colour had the potential to wipe the smile of Nintendo’s face. Ultimately though, and for a number of reasons, it failed to really take a chunk out of Nintendo’s sales. Personally I never owned the GBA – but my brother did. I remember the first time I ever experienced F-Zero. It was utterly awesome. I was totally won over by the stunning graphics and amazing gameplay and played for hours and hours (to the annoyance and frustration of my brother). Other popular games included Legend of Zelda: Minish Cap, Metroid Fusion, Final Fantasy Tactics Advance, Advance Wars and Tony Hawk’s Pro Skater 2. There was such a wide range of awesome GBA titles available, and even Sega endorsed the system with the release of Sonic Advance. 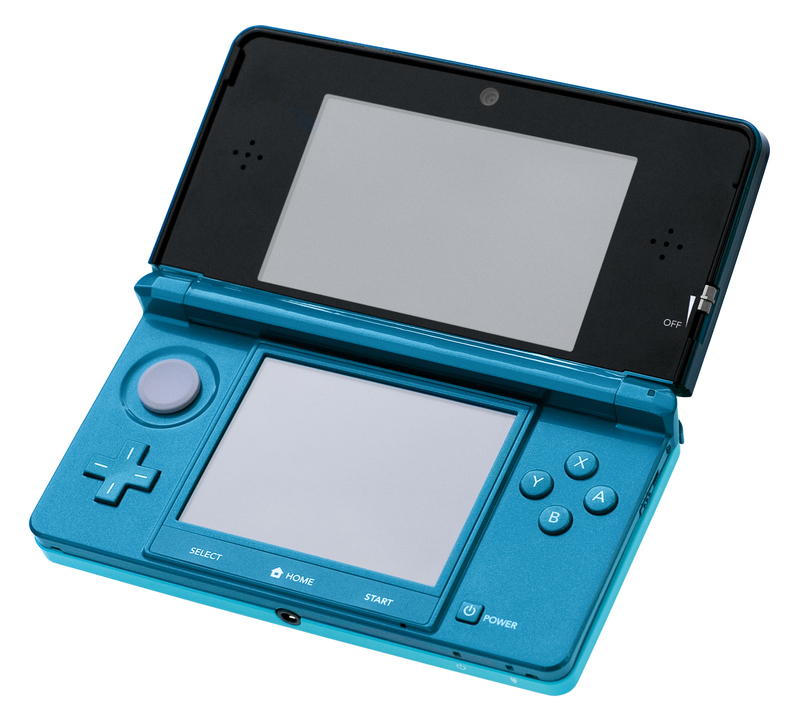 No one can deny the success of the GBA but it was eventually replaced by the SP in 2013. The SP wasn’t a brand new console but rather an improved version of the GBA with a new clamshell design and rather crucially it sported a front-lit display. The SP was also massively successful and in 2005 it was again refreshed by means of a new and much improved rear-lit display. Back in the mid 90’s the Virtual Reality craze was taking the world by storm. A new generation of games consoles promised processing power like never seen before and we were led to believe that virtual reality (VR) was finally on the verge of becoming mainstream. Of course our expectations were way too high and consumer VR never really materialised. The technology of the day was bulky, uncomfortable, underpowered and grossly expensive. There is however one piece of hardware that stands out from the crowd. This comes in the form of Nintendo’s Virtual Boy. 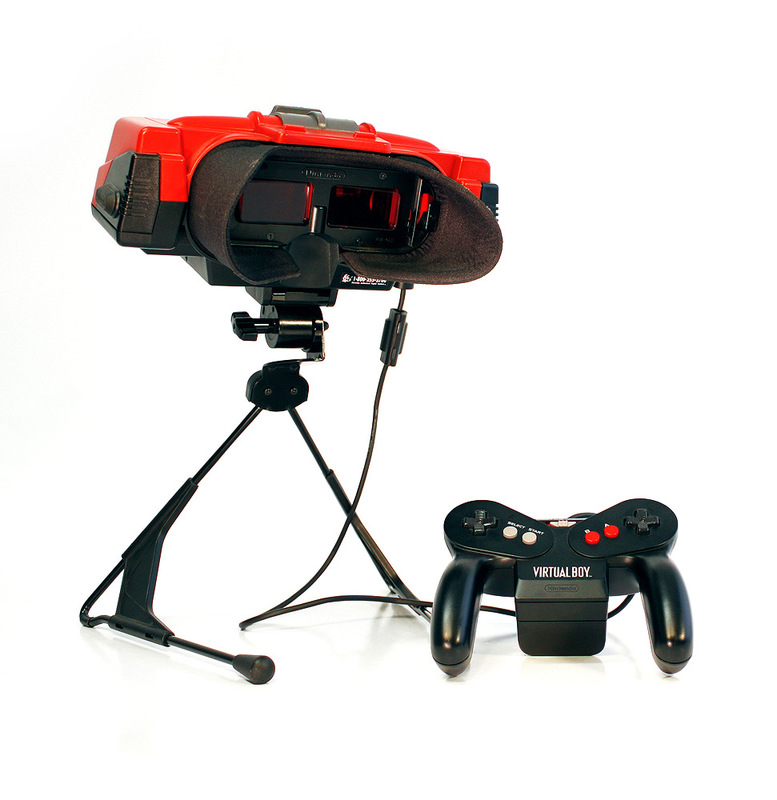 In 1995 at the height of the VR craze, Nintendo released its first standalone consumer VR system – The Virtual Boy. Although the Virtual Boy was initially only available in Japan, it later became available in the US for a tidy $180. Although not massively expensive, the Virtual Boy was more costly than some games consoles of the time. It was also riddled with problems. Ultimately the Virtual Boy was doomed from the beginning. The virtual Boy was slated as being the worlds first 32bit gaming console. Although Nintendo was heavily engaged in developing the N64 at the time, the Virtual Boy was still more powerful than the current 16bit systems. The system incorporates two LED displays (one for each eye) and creates a 3D effect via two rapidly oscillating mirrors. Although graphics were rather limited by the red monochrome display, it was praised for its high resolution – 384 x 224. The whole system was powered by 6 x AA batteries. Although described as a portable device, the Virtual Boy was far from such. It had a bulky cumbersome design which required being set up on a flat surface to use. It was not truly portable in that you could not sit it on your knee and play it on the bus, for example. As such, it was far from a comfortable gaming experience with users ofter having to hunch over to play. 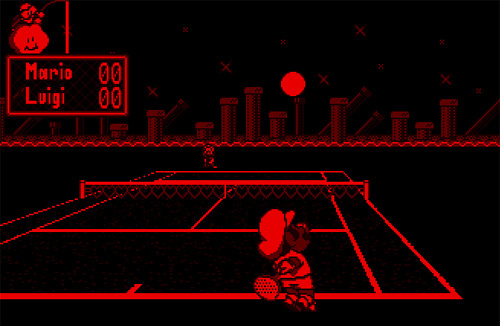 Another issue derived from Nintendos decision to use monochromatic screen technology which incorporated only red LED’s. Nintendo claimed that this helped to keep costs down but in reality it just made for a very miserable gaming experience. Literally everything was red, black or something in between. This slightly undermined the 3D effect and made the experience less immersive. Unfortunately, users of the Virtual boy complained of eye strain, sickness and general unease during gameplay. This was largely attributed to the monochrome display and poor design ergonomics. Although Nintendo had incorporated pauses into gameplay it did little to improve the overall experience. Another nail in the coffin resulted from a serious lack of games – only 14 were ever available in the US! Whilst the Virtual Boy did not deliver the virtual experience that we expect today, it did go some way in creating a unique and immersive gaming experience with had not been seen before. Unfortunately because of the various issues with the system Nintendo just couldn’t shift enough units. Even subsequent price reductions did little to increase sales and Nintendo struggled to get developers on board. Ultimately the Virtual Boy was a commercial disaster and was discontinued in the US in early 1996. The Virtual Boy did however show Nintendo’s commitment to innovation and certainly paved the way for the immensely popular 3DS – a truly portable 3D games console. At long last Googles popular Glass hardware is available in the UK through Googles Explorer program. Google Glass initially went on sale In the US back in 2012 but this was strictly invite only. If you want to look like a complete burke then Google Glass is now yours for a mere £1000. Google have pointed out that Glass is still in its prototype stage and as such would love your feedback. Heres some feedback: Its too expensive! For those of you not familiar with Google Glass, it is in essence a lightweight frame which sits over the eyeglass. It acts as like a head up display (HUD), and in addition to making you look truly awesome, you will be able to access the internet, browse maps and much more. Virtual Reality: Is it finally time? I find the concept of consumer Virtual reality (VR) really exciting. To me what makes gaming more immersive and engaging is the attention to detail and the resulting sense of reality. The more immersed I feel, the better the experience. The result of gaming consoles becoming more powerful in recent years has resulted in contemporary video games feeling much more realistic and engaging. Modern day graphics processors have really pushed the boundaries of what we though possible and we are now entering a new age of realism. 3D technology was the last craze which was slated as taking things to the next level. Modern hardware was capable of rendering games in 3D but whilst the technology became largely affordable, it next quite took off as we had hoped. Having personally built my own 3D gaming PC I was amazed the first time I donned my bulky active shutter glasses and played Battlefield. It was a mesmerisingly beautiful experience and for the first time ever I felt as though I was actually within the virtual environment. This initial excitement soon gave way to apathy, however as eventually I realised that the 3D experience was far from a relaxing one. The concept of putting the uncomfortable glasses on every time I wanted to play Battlefield became a bit of a barrier to my gaming experience. After a few months I just stopped using them. My problem is that I’m a casual gamer. I play computer games when I get a bit of frown time and ultimately I just want to sit down with a game and relax. Whilst 3D goggles aren’t too much of an inconvenience, I just found that I tended not to bother with them. The 3D experience was not a relaxing one and I found I had to be really in the mood to want to play. Unfortunately I think many people had the same issue which is why the consumer 3D experience never really took off. Now whilst I find the concept of virtual reality gaming particularly exciting, I do wonder whether my personal experience will be similar to that of 3D. Virtual reality is a logical progression when it comes to making gaming more engaging. The idea of feeling completely immersed in a fully 3D virtual word is frankly astounding. My fear however is that the virtual reality experience will struggle to become mainstream, as has previously been the case. Can the technology truly become cheap enough for mass consumption? And, will the experience ever be refined enough to keep us wanting more? The concept of virtual reality is nothing new. Actually, the technology has been around since 60’s. Back then however VR tech took up entire rooms and was grossly expensive. Furthermore, the tech was largely used by the military for simulation purposes and was by no means a mainstream experience. There were many advances in the tech over the following two decades but it was not until the 90’s when we started to become obsessed with the concept of virtual reality. We were promised that a new generation of powerful gaming hardware would bring VR to the masses but ultimately it never did. The technology of the day was still expensive and as such struggled to become commercially viable. Nintendo had a crack at virtual reality in 1995 with the release of the Virtual Boy. Although the system differed to what we expect today, it did go some way in creating a unique gaming experience which was at least available to the masses. Unfortunately the system was a commercial flop. This was largely attributed to its high price and the discomfort that the system caused. Moreover, in order to keep costs down, Nintendo opted to use a rather limiting red monochromatic display as opposed to a full colour one. This coupled with poor design ergonomics made for a pretty uncomfortable, nausea inducing experience. Fortunately today advances in technology have meant that consumer VR is much closer to reality. Modern day games consoles are far superior to those of the 90’s and capable of outputting some serious horse power. Furthermore, thanks mainly to Oculus and Sony, a lot of time and money has gone into developing consumer VR systems capable of finally making the tech mainstream. It was a relatively unknown company called Oculus VR that first reignited our passion for virtual reality with the development of the Rift gaming headset. The Rift started off in life as a kickstarted project. Oculus hoped to obtain enough funding on kickstarted to see the project through but ultimately didn’t expect to make any profit. Fortunately for Oculus however thousands of people shared their passion for consumer VR and pledged almost two and a half million dollars in funding. As such the Rift was born. Although the initial Rift prototype incorporated a low resolution display and was plagued with motion blur issues, the latest version sports a beautiful 1080p OLED display and an external camera capable of detecting the position of the head. The current Rift system is looking incredibly promising and looks to offer a very polished VR experience. Rather controversially, Oculus were acquired by Facebook in March this year for a massive $2 billion! Supporters of Oculus we’re furious and accuse Oculus of “selling out”. 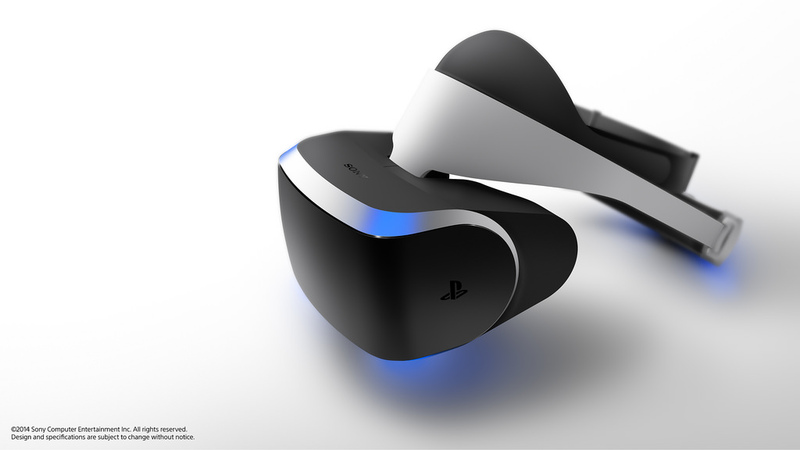 Earlier this year Sony also caused a stir by announcing that they too had been developing a consumer based VR headset known as Morpheus. Morpheus is an immersive 3D headset which features a full HD LCD display and will connect to the PS4 via HDMI and USB. It also offers a 90 degrees field of view and links in with the Playstation camera for motion control. Sony state that at this stage the headset is only a prototype and by no means reflects the final design. Clearly a lot of consideration has gone into the current setup however with Sony claiming that Morpheus is designed for comfort and has good ventilation factored in to prevent the lenses steaming up. What is also interesting is that Samsung are also now known to be developing their own virtual reality interface for their high end smartphones. 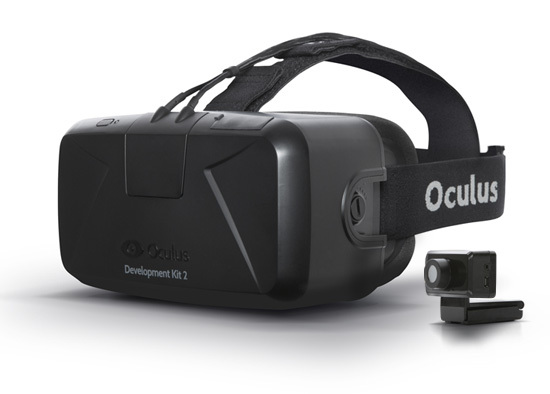 It later came to light via Engadget that this is in fact a joint project between Oculus and Samsung. This mutually beneficial arrangement will allow Samsung access to Oculus’ mobile software development kit, with Oculus having access to Samsung’s OLED technology in return. Samsung’s VR system will not be a standalone device but rather a VR interface to your smartphone. Whilst consumer based VR systems are looking likely to take the word by storm, there is that concern that we have been here before. That VR craze of the mid 90’s (largely inspired by the infamous movie – Lawnmower man) did gather a lot of momentum but of course our expectations were too high and the technology just couldn’t deliver. The VR systems of the time were bulky, uncomfortable and expensive and frankly not what we expected. As such people quickly lost interest in the idea of VR. It is arguably unfair, however to draw parallels with the past. Things are certainly different today. The technology has come a long way from the bulky underpowered systems of the 90’s. The current VR craze – heavily inspired by Oculus and Sony – is again gathering a huge amount of momentum. The VR gaming headsets being presented today promise to deliver, and I for one am inclined to believe the hype. I really hope this is the time for VR to finally become a commercial success but I still have some concerns. The technology has to be truly affordable to be successful commercially. It’s no use if only a select few can afford to invest in VR headsets. Furthermore the systems have to be comfortable and easy to use. It is well known that both Rift and Morpheus have had some comfort issues that need assessing. At the end of the day, if I come back from a hard day at work and need a little down time, the last thing I want to do it strap some bulky uncomfortable headset to my head. If it causes me any discomfort at all I wont want to use it. There is also the motion sickness issue. The VR experience is quite an intense one and renowned for being a little taxing. Again, if this issue is not overcome then I can see VR being a bit of a gimmick with no real long term potential. The experience has to feel refined and it has to make me want to come back for more. I really hope consumer VR becomes a mainstream experience, I just don’t want it to feel taxing. Why I hate feeling disconnected and why I pay so much in SKY subscriptions. Ok folks, so heres a bit of a rant. So I’ve been with sky TV for a year now. Having paid £59 per month for my HD package I am now presented with the concept of my bill going up to £82 per month! Thats a massive price increase, and a huge amount to pay. Yes I have broadband, sky movies and HD, but still, where do these prices actually come from? Ill tell you where – it all derives from a serious lack of competition. Where I live SKY is the only provider of subscription based TV and I know this is the same issue with people up and down the country. We live in a digital age but yet there has still been a serious lack of investment in the data communications infrastructure. I could actually get a TV package with fibre optic broadband much cheaper from one of SKY’s main competitors, however none of these services are available in my area. I even pay for 4G data with EE, but of course I don’t actually get any signal where I live. My point is that the telecommunications infrastructure in the UK is seriously lacking. Unless you live in a big city then chances are you have to put up with decades old technology which results in painfully slow broadband, poor mobile phone signal and high prices! I keep hearing companies such as BT and EE talking about rolling out data services to rural communities, but how long does this actually take? Ill be in old age before I get access to super fast fibre optic services. Other countries are far ahead of the UK when it comes to data communications and frankly we are not doing enough to bring our services up to speed. It was funny hearing the Queens speech a few years ago when she stated the UK government would spend more money on infrastructure. Well it hasn’t made any difference to me because I’m still living in the stone age! So the answer to my question of where do these prices come from is actually quite simple; they charge me extortionate subscription fees because they are my only option and they know it! The day fibre optic is available to all of the UK will be the day that SKY experiences proper competition and actually does something about it. I just can’t quite believe sometimes that its 2014 but yet I still only get broadband speeds similar to what I had about ten years ago! Moreover, people are now talking about 5G data services but I can’t even send a text message from my own home! There has to be something wrong there? I really hate feeling disconnected, I hate not having access to fibre optic services, and I hate having to pay extra for services I can get as a result. Well guys its official, Amazon have finally ventured into the smartphone market with the introduction of the Fire Phone. In what was the worst kept secret in history, Amazon have seemingly been developing their own Smartphone for a while. 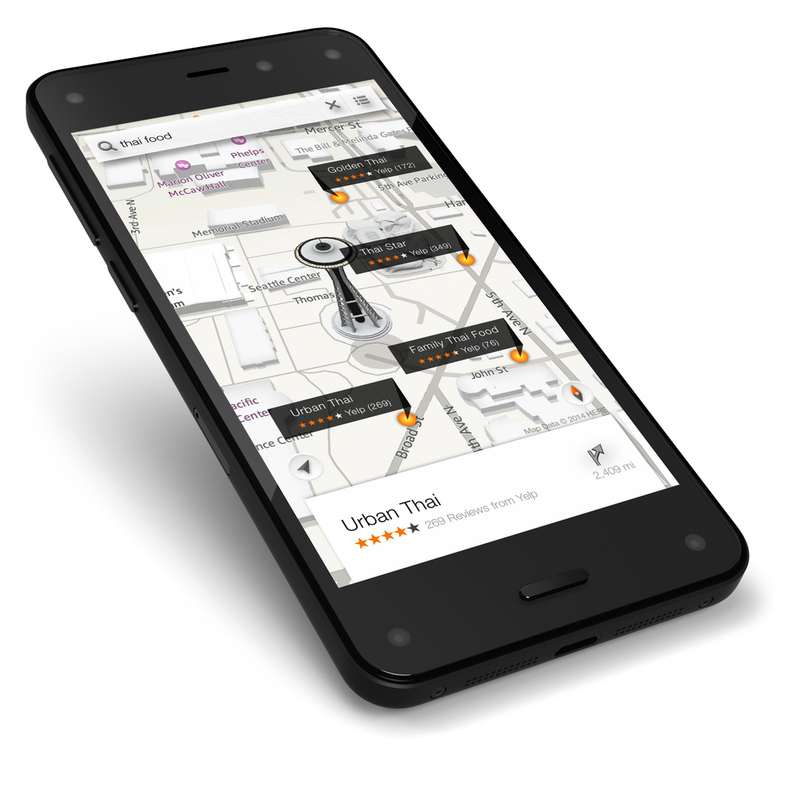 The Fire Phone will join Amazons other Fire products but brings with it a host of new features. 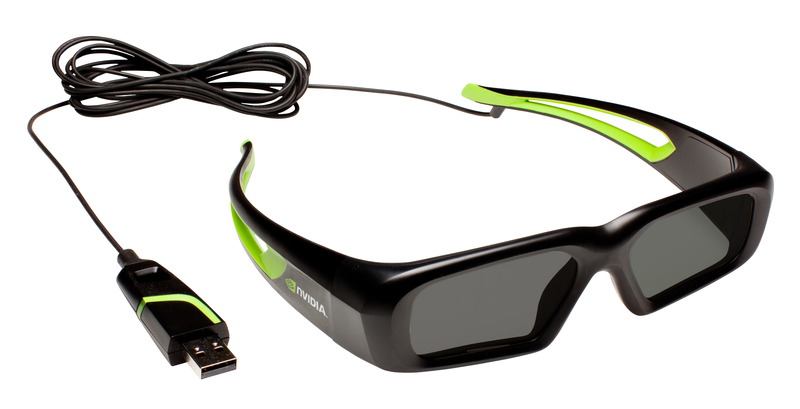 What is particularly interesting is the new head tracking 3D display. More on this later. The device sports a 4.7 inch 720p IPS display and is powered by a 2.2 GHZ quad core processor with an Adreno 330 GPU in tow. Theres also 2GB RAM and it will be available in either 32GB or 64GB external memory configurations. The Fire Phone also has a 13MP camera on the back with a physical camera key, a f/2.0 lens and support for optical stabilization. Amazon claims that the Fire Phone will take better pictures than its competitors and performs flawlessly in all conditions. The camera also has the ability to capture 1080p video but no 4K support. In the sound department Amazon have things sorted with the inclusion of two stereo speakers and support for virtual Dolby Digital Plus surround sound. What is pretty cool is that Amazon are throwing in some pretty nifty knot-free headphones which they claim are better quality than what you get with the average smartphone. What is particularly interesting is the new head tracking technology. The Fire Phone is slated as having a 3D user interface but is very much a different offering to what we have seen in the past. The USP here is phone uses 4 cameras to track the movement of your head and will change the picture depending on how you look at it. This also has some other cool implications including one particular feature which allows you to change the perspective of maps by tilting the phone. Theres another key feature known as Firefly. This heavily integrated feature uses the camera in recognising pretty much anything from books to food. It basically acts as your all in one search facility and will make use of the camera and microphone in finding what it is that you looking for. This feature will be heavily linked into the Amazon store and clearly represents a source of income for the company. Amazon boasts that Firefly is capable of recognising a hundred million different items and clearly this will be attractive to developers. There is even a dedicated hardware button. The Fire Phone runs on a heavily customised version of Android known as Fire OS 3.5 and will link in seamlessly with other Amazon services. 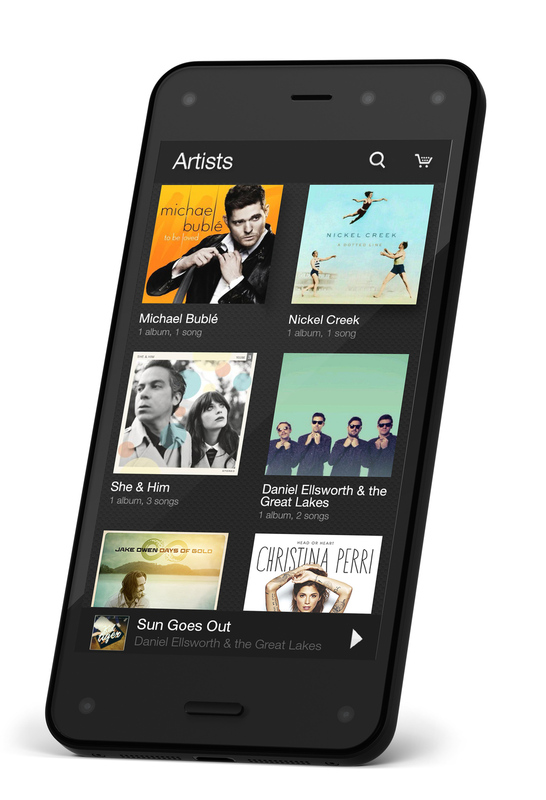 Its also worth noting that the Fire Phone ships with unlimited cloud storage. The Fire Phone is currently exclusive to AT&T in the US and is available to purchase today on a 2 year contract for $199. No word on UK pricing yet. 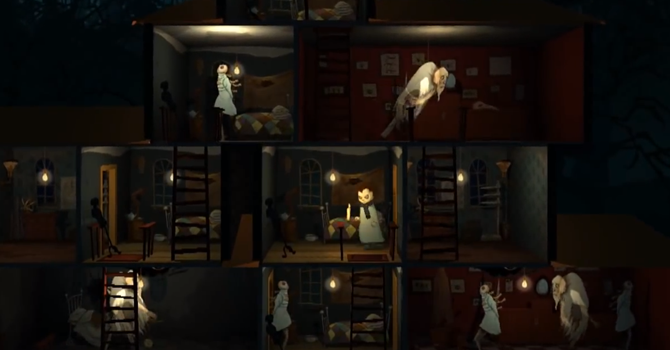 Knock knock is a creepy atmospheric survival game by Russian developers Ice-Pick Lodge. Originally a PC game, it was ported over to iOS earlier in the year, and more recently Android. The game itself is wonderfully strange and very difficult to describe. Even now I am still not entirely sure what you have supposed to be doing. The game is all about the atmosphere that it creates. It recommends at the beginning that you use headphones and turn down the light. This is not your typical game so to get the best experience you need to really play in the right conditions. When you do, the game becomes wonderfully creepy with brilliant sound effects and plenty of jumps. 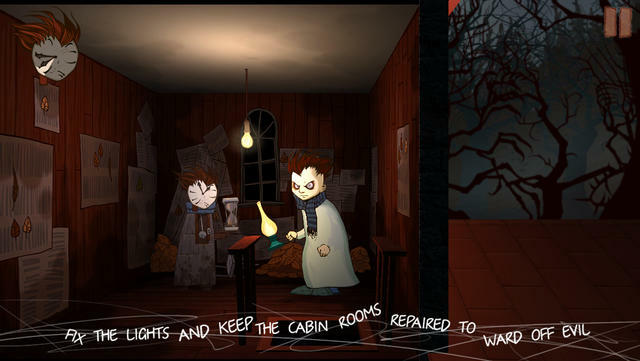 Basically the game follows a freaky little fellow called Lodger who is persistently kept awake by strange goings on in his equally strange house. You begin the game knowing nothing at all and are forced to explore the house and find your own way through the plot. There are no real instructions so you just have to experiment with the environment and see what happens. Lodger speaks in a creepy little foreign voice which just adds to the general oddness. Here lies a slight problem, however. With the game being a port it is ofter really difficult to read the on screen text. I found myself really straining my eyes in the dark and struggled to follow the onscreen text. This becomes increasingly taxing after a while of play. In essence you task is to survive the night and make it through to sunrise. You are presented with a clock in the top left hand corner of the screen which counts down the hours but you can find clocks hidden around the house which speed this up. Controls are really simple and just consist of pressing the right or left of the screen to move Lodger, and clicking on things to engage with them. Climbing ladders can be achieved by merely swiping up on them. The same upwards swipe of the finger also activates lights in darkened rooms. After a while of getting your bearings you start to encounter ghosts and ghouls. You have to hide from them in order to progress through the night and If you don’t succeed then you will have to start the level again, or certainly part of it. This is the main gameplay element. You have no tools or weapons, you just have to hide or run away from the baddies. The game itself is very interesting and does a fantastic job of scaring the crap out of the player. It achieves this aim very well. The gameplay itself is also simple but can get a little bit tedious after a while. I often found myself wondering what the hell I had to do next, and the game certainly doesn’t really guide you at all. That said it is really fun to play, providing you set the mood first! Visually everything looks great. The lighting and shadow effects work really well and everything looks super sharp on your smartphone display. I have no complaints about the visual experience at all. If you like games with structure and purpose the Knock Knock is not for you. If on the other hand you enjoy new experiences and get kicks out of laying on the sofa with the lights out, then this is certainly the game for you! I have enjoyed playing Knock Knock and find it has enough intrigue to keep me coming back for more.